Release two included new Resident and Leasing Portals, a cash payment solution in conjunction with MoneyGram, the next generation of In Office Payments, and an updated integration. ClickPay has been building new portals for our real estate clients. Our engineers have been working on two process automation platforms designed specifically for the real estate industry. ClickPay’s Leasing and Resident Portals will undoubtedly disrupt the market and help clients achieve maximum operational efficiency. By identifying the most cumbersome and manual processes that are deeply embedded in property management operations and electronifying each one into a streamlined set of automated procedures, tasks that would take hours now take minutes. -Through ClickPay’s Resident Portal, client representatives can assign work orders while checking ledger balances, review applications while distributing leasing agreements, and communicate with vendors while posting a maintenance alert all from a desktop or mobile device. -With the ClickPay Leasing Portal, payments can be submitted with applications and leases, and leasing documentation can be prepared, managed, distributed, and signed electronically. Communicating with prospects and occupants is easily accomplished through the built-in email, SMS, and social media messaging manager. To learn more, please visit ClickPay’s Leasing or Resident Portal page or click here to schedule a demonstration. ClickPay is proud to announce our cash payment solution in conjunction with MoneyGram. ClickPay payments can now be paid in cash, accepted electronically, and applied to living expenses such as rent, utilities, or other ancillary charges by simply visiting a MoneyGram location. This will provide you and your residents a secure and reliable solution to replace on-site cash and money orders. 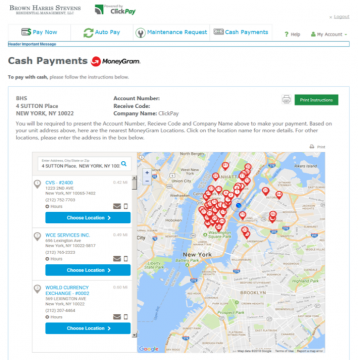 Not sure where a MoneyGram is located? No problem! ClickPay has built in an API-powered lookup tool into each resident’s home page. ClickPay has also empowered your on-site staff with ClickPay’s Invitation Wizard. Our Invitation Wizard has been enhanced to guide residents to the nearest location and provide them with the key pieces of information needed to submit a cash payment. Once the resident transaction is complete, ClickPay’s newly developed MoneyGram API will integrate directly into each client’s accounting system in the same fashion as a credit card, e-check, ACH, or lockbox payment. Contact your client success representative to find out more, email support@clickpay.com to sign up for cash payments, or click here to schedule a demonstration. ClickPay has launched the next generation of In Office Payments. As a response to the overwhelming demand of our customers for both reoccurring and miscellaneous payments to support on-site managers and leasing professionals, ClickPay has released a new version of our popular In Office Payments module. This new version supports an administrator’s ability to collect payments from both residents, visitors, and prospects, leveraging our experience across the real estate landscape of HOAs, rental and condo / co-op communities. The new In Office Payment module leverages this experience along with the power of our 30+ software integrations to validate balances and create significant efficiencies to the on-site payment acceptance processes. We’ve updated our integration with SiteLink, the leading software for self-storage management. https://www.sitelink.com/. The complete platform for real estate billing and payments. As the industry-leading platform for automating real estate receivables, ClickPay accepts all payment methods, including paper checks, e-checks (ACH), cash, and credit & debit cards. ClickPay delivers integrated print and e-bill presentment and payment services to increase operational efficiencies and enable profitable growth. Shaping the future of real estate billing and payments with innovative products and services, ClickPay provides property management companies with customizable solutions to connect with their tenants, residents, and homeowners. To learn more, go to https://www.clickpay.com. with ClickPay can help your business.